As long as human beings have been walking around on the planet earth, they have had to wear leather shoes to protect their tender feet. 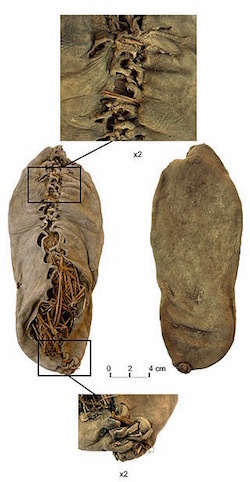 The world’s oldest shoe yet found is c. 5,500 years old (left). 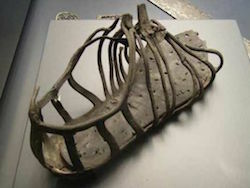 Called the “Areni-1 shoe,” it was found by an international team of archeologists in an Armenian cave in 2008. Combined with the cool and dry conditions in the cave, the floor of the cave was covered with a thick layer of sheep dung which sealed and preserved the size 7 shoe. Notice the tanned leather and leather shoe laces. The straw found in the shoe has been dated as old as the shoe. Perhaps it was an extra padding for warmth and rocks. 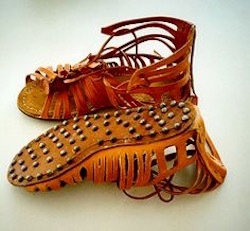 The shoes of the Ice Man (above) were made of deer hide. 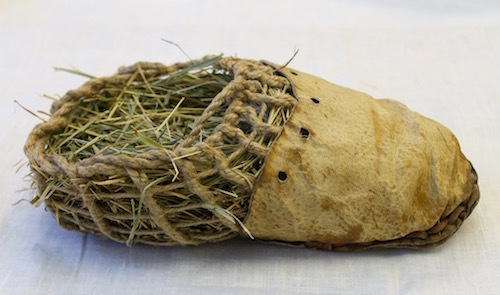 The soles of the shoes were bear skin and for insulation and warmth the insides of the shoes were stuffed with soft grass. One academic posited that because of the complexity of the shoes, there were probably cobblers around in very ancient times. If we skip thousands of years forward to the times when the early Christians and the ancient Romans mingled in the market places and battle fields, we see that shoes WERE made by professional cobblers and they have been “refined,” not “re-designed,” because they still are made of leather and still are indispensable to walking around. Or to running around as in the case of a 2,000-year-old Roman shoe (on the left) discovered in 2016 in a ditch at a Roman fort, Vindolanda, near Hexham Northumberland. 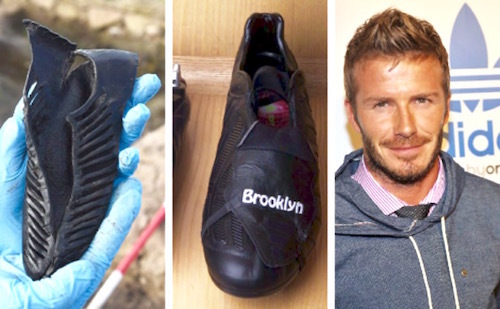 To the discoverers, the Roman shoe looked very similar to the one worn 2,000 later by David Beckham, the English professional footballer. 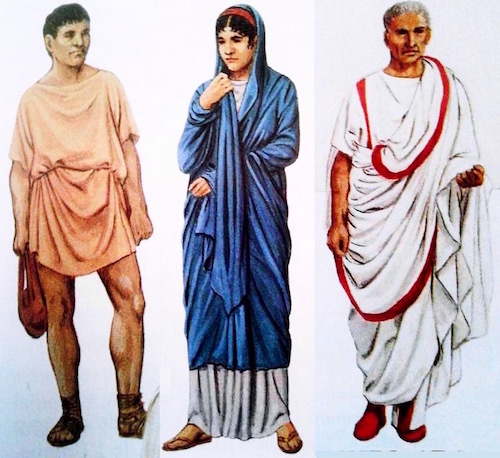 Because ancient Rome was warmer than the “oldest shoes” found in northern Europe, they primarily wore what we wear in the summer, sandals. On the left above is a simple sandal worn by the Roman and Christian people in the 200’s AD. Soldiers in Rom’e legions wore caligae (left), heavily-soled hobnailed (cleated) boots. They were made of leather. As has been seen, shoes have been made from the skins of animals for…ever. A pitiful death was caused by those cleated shoes during the Battle for Jerusalem in 70 AD when the Romans were besieging the Jews. The Jews eventually lost Jerusalem, but they fought tooth and nail for every part of it. 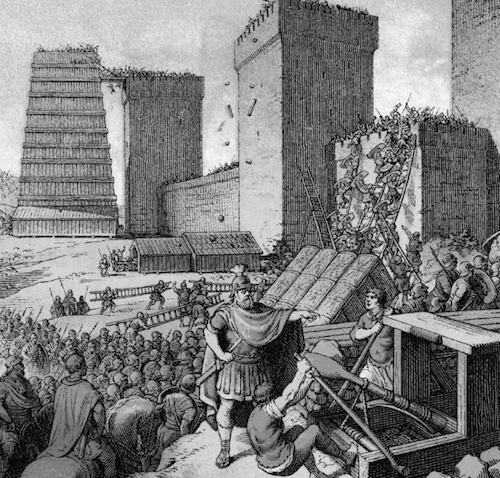 The Romans had taken possession of the Tower of Antonia in mid-July of 70 but they fell back to reconnoitre. When a valiant Roman auxiliary soldier named Julian saw that his mates were retreating, in a rush of heroism he ran after the Jews and killed many of them. Titus, the Roman general, and his soldiers watched in admiration, but something happened. Josephus is one of the only writers in antiquity or anytime who describes a death as a result of shoes. The hobnailed/cleated shoes of the military were, also, used by commoners for hiking and walking in rough terrain. All Roman footwear was flat-soled. High-heels did not come into fashion until the late 1500’s. 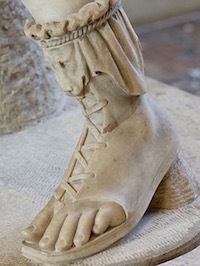 The Romans essentially always wore a variation of the open sandal, each with its own name. 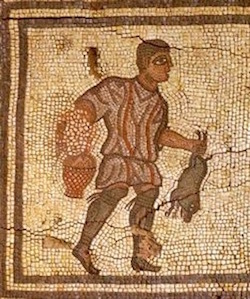 Notice the calceus (a usually hobnailed, thick-soled walking shoe) on the hunter from this mosaic (left) from Villa Romana del Casale in Sicily—300’s AD. The hunter is wearing a colorful tunic and heavy woolen protection on his legs. Shoes in ancient times as in modern times often told the status of the person. Here (below) one sees the normal Roman man’s high-strapped sandal, the normal woman’s sandal secured, as it is today, with a leather thong between her toes and the somewhat effete closed red shoes that a Roman senator was forced to wear. Shoes have always shown status. The more fancy the sandal, the higher the price. The very wealthy in Rome paid many sesterces for their shoes. 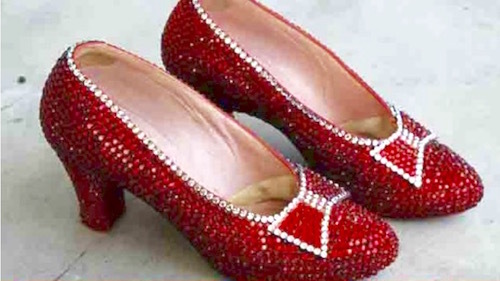 In our modern world the highest price ever estimated for a pair of shoes was for a replica of the red shoes Judy Garland, as Dorothy, wore in The Wizard of Oz.